Good Communication = a Good Home Exchange Experience? I was taking advantage of an extra hour in bed this morning, as the clocks went back an hour for the winter, to finish reading Eats, Shoots & Leaves, a surprising best selling book in the UK this year. How sad is that to admit to reading a book on punctuation from cover to cover? Well, it is short and it is funny and perceptive. It started me thinking about the emails we get at Home Base Holidays from time to time from members with a complaint about other members. Fortunately these are few and far between, certainly serious ones are. With the minor complaints or comments on an exchange, it often seems (reading between the lines) that the majority of such problems were likely caused by a lack of or poor communication between the members rather than by malicious intent on the part of one. So what has this to do with a book on punctuation? Perhaps little, potentially a lot; take the comma out after 'Eats' in the title and it changes the meaning completely and is much more likely to be accurate when you find out that the phrase is about a panda! I was unsure (whether to accept the offer of hospitality) but I had paid a lot of money for my ticket and spent months organising my house and buying her peanut butter. I think the best thing exchangers can do is to carefully read the e-mail sent by potential exchangers to see if the messages are coherent, spelled correctly, and answer previously asked questions. I only had to read one of --------------'s e-mails, and I knew immediately they were people I wanted to stay in my home! The sentiment behind these suggestions is sound, i.e. deciding whether the potential exchange partner seems a reasonable and responsible person with no big hang-ups or personal problems (the way we all like to think we are ourselves!) It's a good starting point, but it could mean it may be much harder for people to arrange an exchange who were at school at a time when learning to write 'proper' English wasn't considered a priority, or who just find writing difficult. However, good and regular communication is very important, both to persuade others that yours is an attractive home exchange offer, and later, during the detailed preparations before an exchange takes place. As such, it is essential for everyone arranging an exchange to make an effort to communicate clearly - and to ask their exchange partners to explain anything they don't understand rather than leave it to chance. It would be interesting to get feedback from experienced home exchangers. Did first impressions count in your decision on whether to go ahead with an exchange? Did you encounter any problems through a lack of understanding between you and your exchange partner? How did you ensure your exchange plans went smoothly? 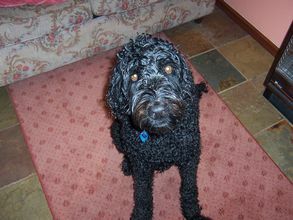 This is a picture of Ben in his home in Rockingham, near Perth, Western Australia. Who could resist an exchange offer that includes Ben as part of the package!? Well, of course, some people might not like dogs or have an allergy to them or not want the responsibility of caring for a pet while on exchange. So maybe Ben's photo will warn those people off right away (a good thing) but just maybe more (and some children perhaps?) will be attracted to an exchange listing that stands out from those that include only photos of the home. Since all Home Base Holidays listings can now include up to five photos, there's an opportunity to have both photos of a home, that give a good idea of what it is like, plus to use some space to include one or two photos that are a little bit more personal or different. Ben's owners (two adults and two teenagers) are looking for an exchange to England to visit family. Their exchange offer gives detailed information on their home, pets and area, including photos of their home, swimming pool and interior views as well as Ben's picture. Check out their listing, HE15726, for full details. Now that Home Base Holidays members generally upload their photos directly to their listings, we don't always notice all photos right away. It's always fun to come across some really good ones. I was thinking this yesterday when a new member in Nice, France, joined and immediately added three beautiful photos that give a real feel for the atmosphere of the apartment and location. Check out this listing, HE15914 (two adults looking for a swap to London, June - Sept 2005). Not everyone will have such an artistic eye to see the potential to take such imaginative shots but maybe these good examples will give some inspiration to other members. Home Base Holidays members - log on to view listings by User ID. Anyone on Exchange in the Chicago Area This Week? I'm a freelance writer and am doing an article on home exchange for the real estate section of the Chicago Tribune. I am trying to find a couple of examples of people from outside of Chicago, preferably outside the U.S., who are in the middle of a home exchange in the Chicago area and would be available for an interview and photos. I'm trying to find samples sometime this week and thought you might be able to provide a couple. Thanks very much. If you might fit the bill please contact Chuck directly. A Face Lift for Home Base Holidays - Check Out Our New Look! This is an exciting day for us as our brand new shiny design for the Home Base Holidays website is launched. Over the last three years we have concentrated our website development on the primary functionality of the site - home exchange listings information and layout, making browsing the listings as easy as possible, increasing the number of ways search results can be displayed and/or restricted to give the most accurate results, developing new features in the private member area of the site. Although the core database part of the website will always be most important, it was time to smarten up the information pages too (a bit like spending lots on doing up your house and finally getting around to painting the front door!) However, with lots of help from our designer/programmer, Nick McAdden of Neteffects Multimedia Ltd, this re-design was much more than the equivalent of painting the front door - more like painting every front door in the street and putting up new signs to direct traffic better to all the houses on the street! Enough of the door painting analogy (although rather appropriate for a home exchange site?) - what we hoped has been improved most in the new design is the ease of finding the information you are looking for on the site. The navigation links in the left hand column remain the same on all pages (apart from the individual newsletter pages and the search pages). These navigation links are listed under headings - Home Exchange Search, Members, Visitors and Further Information. The main links are repeated along the top of the page and in the Quick Jump Menu, along with a new Site Map page. The Site Map mirrors the headings and links in the left column but expands on these with descriptions of the information you will find on each page plus additional links to other pages on the site for further information. When closely involved with a project, as I am with Home Base Holidays, it is always difficult to know for sure if what seems very clear and logical is as easy to understand by someone using the site, perhaps as a first time visitor not familiar with the home exchange concept. Rather than grabbing strangers off the street and forcing them to be my 'focus group' to hear a variety of views on what they might find good, bad or indifferent about our new design, I would really welcome your feedback once you've had the chance to look at the site and try it out. Either add a comment to this post or contact us directly. Website development is on-going and the best ideas for new features often come from Home Base Holidays members and visitors. This is a comment received recently from New Zealand member, Cathy Lawie-Phillips. I thought of Cathy's comment when adding this photo to a listing this week. 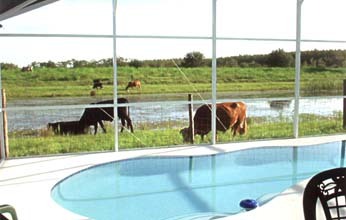 Maybe it's just me being nostalgic for my childhood (having grown up on a farm in Canada), but the thought of relaxing by a pool while cows grazed in the adjoining field, seems like perfect bliss! This holiday villa, in Kissimee, Florida, is currently available for rental (the owners' home in Lancashire, England, is available for exchange) and the picture really does give a feel for the location that would be difficult to describe in words. Some Home Base Holidays members have a way with words and their descriptions are interesting and full of information on their home and area while others, whose exchange offers are often just as attractive, find it difficult to describe that which is so familiar - attractions and facilities can easily be taken for granted when you live in an area. This is where photos (exterior of the home, garden, views from a window, inside shots, family photos, local scenes, etc) can really lift a listing and attract those like Cathy who might otherwise overlook the offer. Even if your home may not seem particularly photogenic to you (maybe your typical London Edwardian semi looks very much like all the others in your street - as mine does!) it may well attract people who live in modern homes but who are fascinated by the many period details often carefully preserved in older homes. Use your imagination when taking photos of your home to include in your home exchange listing (digital cameras make it so easy to take lots of pictures to get just the right ones). Now that up to five photos can be added to each listing (the first of these is also shown as a thumbnail in search results), if you are a current Home Base Holidays member, do consider logging on and adding photos to your listing, if you haven't already done so, to help make your offer stand out. If you aren't yet a member, get snapping and hopefully you will join soon. View Cathy's exchange offer in Auckland (with photos of course!) and read her article on her first exchange last Christmas to Utah in the April/May 2004 issue of Home Swappers Newsletter. When you think about it, people who take part in home exchanges must be some of the most generous, open minded, trusting and considerate people in the world. Give yourself a pat on the back if you are already a seasoned home swapper! The reality of home swapping is not nearly so sensational, but it's true that many people could never accept that it can work so well and they should not even think about exchanging homes (nor should the seriously overly house proud who are likely to be critical of house keeping standards that don't match their own). However, most people (even generous, open minded and considerate people) do have legitimate concerns at first. It's only once they understand the process of how exchanges are arranged, generally over quite a lengthy period when the two parties are exchanging information through many emails and phone calls, that they realise that it's not nearly so scary to entrust their homes to the exchange partners they will have got to know over the course of this extensive pre-planning. So how do you go about finding exchange partners that you are going to feel comfortable with and who you can trust will respect any special concerns you have? First, you check through the Home Base Holidays listings regularly (as a member you will be able to log on to your member area to view full listings) to look for those members whose offers are of interest - destination and exchange dates seem to fit with your plans, their home is in an area you'd like to visit and looks like it would suit your needs. Also check for the sort of information that's important to you (you will see much of this type of information in the ticked options in the listings). For example, if you are a smoker, does the member allow smokers in their home? If you have pets that need to be cared for - has the member offered to look after pets? Your home may not be suitable for children - does the member have young children? This is your starting point. Once you have found a good match, where dates and other considerations seem to look good for both of you, then you need to really ensure that you are both aware of any particular requirements - and be prepared to respect these while in each other's homes. This long preamble is really just leading up to a reminder of your responsibilities as a good home exchanger. The vast majority of members need no reminders but, just occasionally, we get feedback from a member that indicates a lack of respect was shown for their needs (which may be due to either poor communication or just plain lack of consideration). A few examples: maybe your exchange partner who doesn't allow smoking in her home or even outside an open door is not just been pernickety but actually has serious allergies; a member may have religious or ethical beliefs that require that no meat be cooked in their homes or maybe drinking alcohol is forbidden in the home; if a member's cat is a house cat, there will be a good reason why you are instructed to not let the cat outside while in your care; perhaps the member runs a home business and you haven't been given permission to use their computer for security reasons (if you do need a fast internet connection yourself, find out if this is available beforehand). Even if some requests may seem over fastidious to you, it's possible that some of your own requirements may seem bizarre to others! Take time and care when arranging your exchange, swap with members who appear to have similar attitudes as yourself (even more important if you are doing a hospitality exchange), respect each other's differences and special requests, and you should both have a great home exchange.